The 2018 Lippincott Pocket Drug Guide for Nurses provides current, vital drug information "in a nutshell." Based on the popular Lippincott Nursing Drug Guide by Amy Karch, this handy pocket guide by the same author gives essential information on over 2,000 medications in an easy-access A-to-Z format. The "mini" drug monographs include generic and trade names, drug class, pregnancy risk category and controlled substance schedule, "black box" warnings, indications & dosages, dose adjustments, adverse effects, drug interactions, nursing considerations, and patient teaching. A special section reviews Patient Safety and Medication Administration. Appendices cover topical and ophthalmic medications, laxatives, combination products, contraceptives, biological agents (vaccines), and more. Also includes free online access to Monthly Drug Updates and a Toolkit loaded with hundreds of additional drug-related resources on thePoint. The pocket-sized 2018 Lippincott Pocket Drug Guide for Nurses will quickly become your go-to guide for important drug facts and vital patient safety tips and alerts. Vital information you need, right in your pocket! This series of 335 beautifully illustrated flash cards explores essential concepts of human anatomy & physiology. The 4? x 6? cards are color coded and indexed for easy reference. The flash cards are printed on heavy card stock and are UV coated for durability. 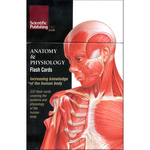 Now available in a portable edition, this series of 50 flash cards explores the essential concepts of human anatomy. The 4" x 6" cards are organized into 11 systems and are color coded for easy reference. The structures are beautifully illustrated in exceptional detail, with areas for self study notes on the back. Ideal for medical students on the go, or anyone who requires a lightweight compact series that can travel anywhere. Flash cards are printed on heavy card stock and UV coated for durability. Passing your admission assessment exam is the first step on the journey to becoming a successful health professional - make sure you're prepared with Admission Assessment Exam Review, 4th Edition! From the testing experts at HESI, this user-friendly guide walks you through the topics and question types found on admission exams, including: math, reading comprehension, vocabulary, grammar, biology, chemistry, anatomy and physiology, and physics. The guide includes hundreds of sample questions, step-by-step explanations, illustrations, and comprehensive practice exams to help you review the subject areas and hone your test-taking skills. Plus, the pre-test and post-test help identify your specific areas of weakness so you can focus your study time on the subjects you need most. If you want to pass the HESI Admission Assessment Exam or any other admissions assessment exam for health professions that you may encounter, there's no better resource than HESI's Admission Assessment Exam Review. Mnemonics are a proven way to increase the speed of learning and length of retention. This Mnemonic book for nurses and nursing students is packed full of 94 mnemonics with full descriptions and images to help you accelerate your learning.